So beautiful is Mahone Bay, it’s one of the few places in Nova Scotia where many things stay open in the winter. 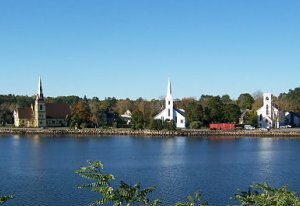 If you don’t want to stay in Halifax, consider Mahone Bay as an alternative base for exploring nearby attractions like Peggy’s Cove, Lunenburg and Bridgewater. The harbourfront is the heart of Mahone Bay. Three historic churches are perched on the water’s edge and host a series of concerts through the summer. The downtown area is filled with craftspeople, art galleries, quaint shops and restaurants. Don’t miss the Amos Pewter shop and its beautiful Christmas ornaments. Book a room at one of the gorgeous B&Bs and stay several days. You can also visit as a day trip nearby from Halifax, using a shuttle service. Celebrations run throughout the year. There’s the Classic Boat Festival at the end of July. The Scarecrow Festival is in October and the Father Christmas Festival in December.